Gayle Nelson, owner of Gayle's Salon & Spa, attributes the success of her career to thirty-two years of dedicated passion to the hair, make-up and skincare industry. It all began in 1982 when, at the age of twenty-two, she opened her first salon in Pentwater. Just four years later she opened a new salon, Gayle's Headlines, at her current location between Hart and Pentwater. Gayle was thrilled when, in 2002, the opportunity to expand into the skincare, massage and spa aspect of the industry presented itself. With the opening of her second business, etc… salon and day spa in downtown Pentwater, her dream of providing a full service salon materialized. 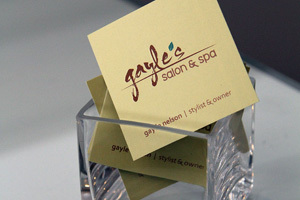 In the fall of 2013, Gayle decided to merge the two salons. With a name change and building addition and renovation, she is now able to provide full salon and spa services at one location, three miles from Pentwater, featuring state of the art equipment, a professional staff and a new, relaxing atmosphere. 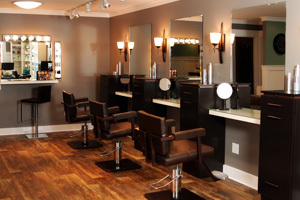 From trend-setting cuts to luminous color, their full-service salon is staffed with educated and experienced stylists each trained to understand your style goals. The stylists at Gayle's Salon & Spa transform hair using the latest, proven techniques. From cuts and curls that redefine your hair's ambiance, to smoothing treatments and hair extensions for luxurious silky length, hair is their passion, and you their focus. Manicure services at Gayle's Salon & Spa feature signature hand therapies, including massage and scrubs, which soothe both your hands and your soul. Choose from traditional or Shellac polish, or collaborate with our stylists to create a custom nail art look. Prices start at $25. Their pedicure niche was designed with serenity in mind. Let their copper basin pedicure bowls and leather chairs embrace you as your tired feet are exfoliated, hydrated and massaged. Relax and enjoy the woodland view through your own person picture window. Prices start at $40. Whether your skin is in need of a splash of hydration or you would like to see improvement in the texture and tone of your skin, you are sure to love the results and therapeutic benefits of their spa facials. The skincare professionals at Gayle's Salon & Spa perform skin cleansing and age-defying treatments that will leave your skin vibrant and healthy. Prices start at $75. From a night on the town to any special event, their make-up and lash extension applications are sure to compliment your look. They use Mirabella Beauty--the leading line of cosmetics known for their gorgeous, natural mineral make-up. They also airbrush foundation for a flawless, natural looking, picture perfect complexion. Have longer, fuller lashes with eyelash extensions from Xtreme Lashes. Flirty lashes--the perfect accessory! Make-up starts at $35, Special Occasion Lashes $15, Xtreme Lashes start at $200. 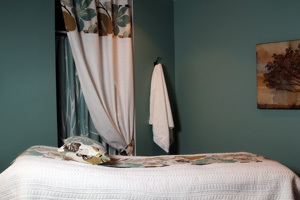 Relax, repair, and rejuvenate with a tension-eliminating massage or invigorating body treatment. The massage therapists at Gayle's Salon & Spa are experienced with everything from Swedish to hot stone; they have the massage to make your stress a thing of the past. Prices start at $45. Body treatments, like salt scrubs and body wraps, performed by our spa specialists, envelop your body, providing a head to toe experience that polishes and gives your skin a luminous glow. A custom hair removal session, using sensitive-skin sugaring or a traditional waxing approach will get you vacation and swimsuit ready in a secure, professional environment. From perfectly arched brows to fuzz-free legs or a trip to Brazil--they can make unwanted hair a distant memory. While Gayle understands the importance of a great environment, she firmly believes that it's the contribution of her team of co-workers that makes a successful business. She is justifiably proud of them all. If you ask anyone on her team why they love working at Gayle's Salon & Spa, they'll likely tell you: "Because we're a family." For Gayle, that says it all.